Somewhere in London there is a tiny closet flat, that is smaller than a snooker table. 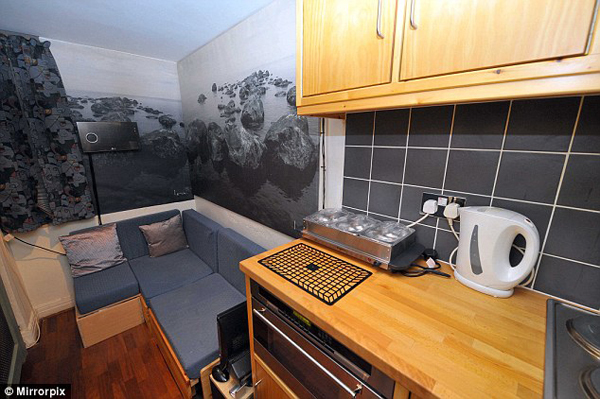 This amazing apartment is now on sale for 200 000 £, which is 35 000 £ than the average flat in London. 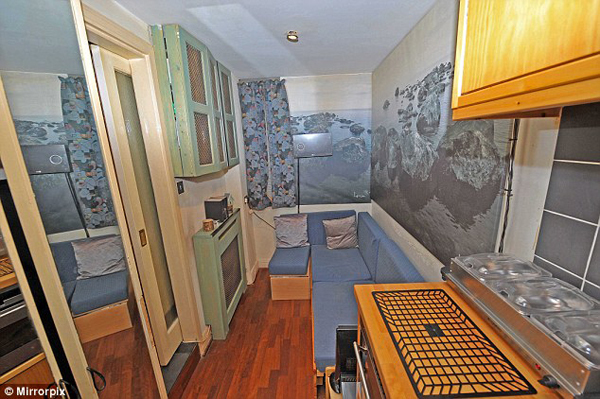 This post explains exactly why this tiny apartment worth more than a normal sized one. Remember how you always complain about how pathetically small is your living space. Imagine how life is for Ray Barker, the owner of the 11 ft by 5.5 ft flat. It is not a very big space, but very functional. It has most of the needed appliances: sofa for sleeping, little cupboard, a bathroom and space expanding wallpaper. Originally bought in 1987 for only 37 000 £ by a secretary, this closet space was converted into apartment and sold for 120 000 £ about five years ago to its present owner. The location won over the heart of Ray Barker, the present owner. Located opposite Harrods in London’s plush Knightsbridge area, this flat has many privilegies. Eventhough, the lack of space can make anyone uncomfortable, the present owner was happy with this location, as he could get very fast to his job, while living in this apartment. At present time, the flat is put on sale for 200 000£ and some say even 300 000£. The sale of this house,would allow mr. Barker to buy a 600-year old Ballyfinboy Castle, located in Eire. The tiny flat served its purpose for a 50 year old Ray Barker, oh well, it might as well do some good to other owners.